Author(s) : Kathirvel Subramaniam, Kyung W Park, Balachundhar Subramaniam. This book is a comprehensive reference for anesthesia and perioperative clinicians involved in aortic surgery. 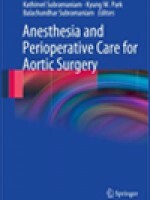 With a primary focus on anesthesia for various aortic surgical procedures, including endovascular aortic surgery, the title also provides expanded coverage of CNS monitoring and protection, intraoperative transesophageal echocardiography, renal and spinal cord protection during surgery, management of aortic trauma, and postoperative care. Written by top cardiac anesthesiologists, surgeons, and intensivists, this indispensable reference provides everything you need to know about the burgeoning field of aortic surgery in one handy volume.